Available General Cargo Ship for carrying break bulk commodities and bagged cargo along with loose bulk cargo for Coastal Shipping within India as well as for shipping from India to worldwide destination. DWT / GRT / NRT 22,273 / 13,695 / 7,738. 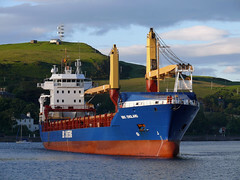 M/V VIETFRACHT 01, 7.700 DWCC – FREE AT BELAWAN ARD 27-31 MAY. 2012 PREFER CARGO TO S.E.ASIA or F.E.ASIA. M/V VF GLORY,– FREE AT CHITTAGONG ARD 19-20TH MAY. 2012 FREFER CARGO TO S.E.ASIA or F.E.ASIA. 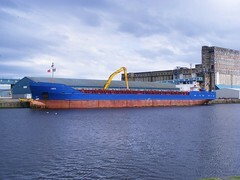 VSLS AIR DRAFT(WATER LINE TO TOP OF HATCHCOAMING IN FULL LADEN BALLAST)IS 15.9M SUBJ TO BUNKER/FW Q'TY. VSL DO NOT TAKE BALLAST IN THE HOLDS. : PORT IDLE ABT 1.5MT IFO PLUS ABT 2.4MT MGO WORKING ABT 1.5MT IFO PLUS ABT 3.8MT MGO BASIS GOOD WEATHER NO ADVERSE CURRENTS, NO NEGATIVE INFLUENCE OF SWELL AND UP TO/MAXIMUM BEAUFORT SCALE 4. VSL HAS LIBERTY OF USING MGO WHEN MANEUVERING, IN/OUT OF PORTS, DURING BAD WEATHER, STARTING AND STOPPING OF A/E, NAVIGATING IN SHALLOW/RESTRICTED/BUSY WATERS, CHANNEL, CANALS AND RIVERS.